Greenmount Avenue is one of Baltimore’s most important north-south corridors. It once was a thriving hub of commercial activity and civic life – and could be so again, thanks to investments the city is making and the advocacy work of community members and Strong City Baltimore. Greenmount touches several neighborhoods where Strong City has done neighborhood and school-based organizing work – including Harwood, Barclay, and Greenmount West – and is just a mile from our future East Baltimore home at the Hoen Building in Collington Square. After Strong City suggested corridor planning for Greenmount Avenue, Baltimore City launched the LINCS program (Leveraging Investments in Neighborhood Corridors) in 2015 to revitalize some of the city’s most important traffic corridors, starting with Greenmount. Because of Strong City’s long history of involvement with the Greenmount neighborhoods, we were selected as the lead engagement partner, ensuring that community voices would be heard and that the city agencies implementing LINCS would be responsive to local needs. Members of Greenmount Avenue neighborhood groups discussed the LINCS plan at a meeting convened by Strong City at St. Matthew’s New Life United Methodist Church. “Strong City was instrumental in going out to the community, getting people to meetings, and setting priorities,” according to Marshella Wallace from the Baltimore City Planning Department. Although progress has been incremental so far, the LINCS plan is poised to take a major step forward, with many improvements about to go into effect up and down the 1.5 mile target area between 29th and Eager streets. LINCS neighborhoods were updated on the plan Saturday, February 2, at St. Matthew’s New Life United Methodist Church in Barclay, at a community meeting convened by the Rev. Eric Lee, Strong City’s Director of Neighborhood Programs and a pastor at the church. Officials from the city Planning, Transportation, Housing, and other departments attended the meeting, along with several dozen neighborhood leaders and residents. The beautiful facade and replaced sidewalk in front of the Greenmount Recreation Center are among the most visible recent improvements along Greenmount Avenue. Create a corridor that is safe and accessible for multiple modes of transit through an improved street design, especially in the Greenmount West section of the corridor. Improve the appearance of the Greenmount Avenue corridor through streetscape improvements, diligent code enforcement efforts, appropriate sanitation disposal, and education. Marshella Wallace from the Baltimore City Planning Department and Strong City’s Eric Lee provided updates on the LINCS implementation plan. As city officials and Strong City push forward with LINCS, neighborhood leaders are also taking action on their own. A Greenmount West Community Association representative announced the receipt of a small grant for a community project to improve public space on Greenmount between North Avenue and Hoffman Street. They will be working over the summer with MICA and the Baltimore Design School on projects such as decorating benches and painting. Strong City is working with the Harwood Community Association and local developers to revitalize the small section of the neighborhood located east of Greenmount Avenue. More than 15 properties have been acquired for rehabilitation or demolition, and 10 of them are under rehab. The stakeholders are also working together to rezone properties along Greenmount Avenue for uses desired by the community. The ordinance needed to rezone this small area has a Planning Commission hearing scheduled for February. 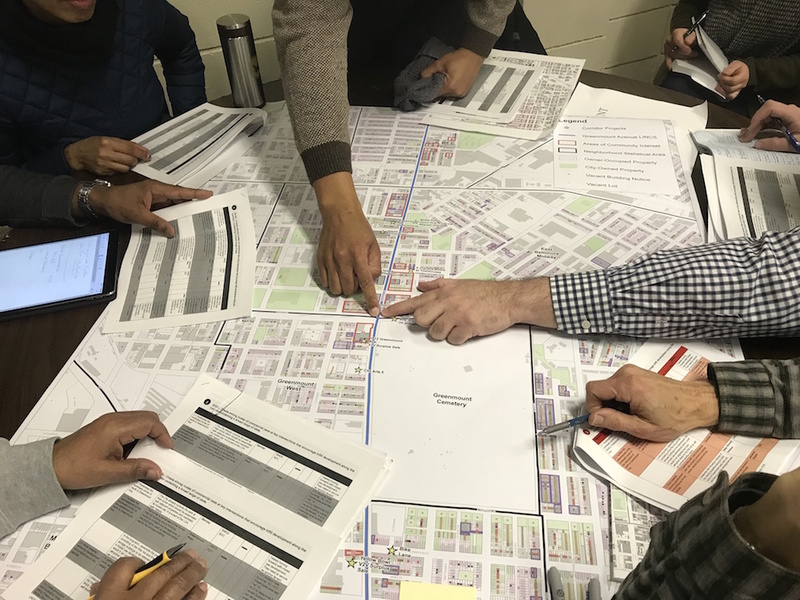 The next quarterly meeting for the Greenmount Avenue LINCS Implementation Strategy is Tuesday, March 19, 1 p.m. at the Baltimore City Department of Planning, 417 E. Fayette St., 8th Floor. All who are interested are welcome to attend.